GDP cooler upgrade with Pass though plate for 2011-2014 6.7 Ford Super Duty. This kit allows the complete remival of the EGR coolers and related plumbing and electronics that are no longer needed when running tuners such as H&S XRT, Mini Maxx, Black Maxx or Spartan Phalanx Dashdaq. 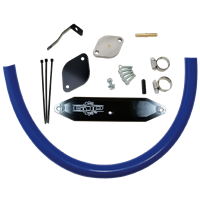 The XDP 6.7L Ford EGR Race Track Kit With Coolant Re-Route Plate XD231 replaces the Exhaust Gas Recirculation (EGR) system found on your race built 2011-2014 Ford 6.7L Powerstroke. This kit allows you to mount a EGT temp sensor probe into the right side exhaust manifold for a pre turbo EGT reading. 6.7 Bottom EGT Plate for 2011-2018 6.7 Ford. USE IF YOU NEED TO INSTALL FACTORY EGT SENSOR INTO MANIFOLD.